Description: The eastbound Southwest Chief zips through Carrollton. Description: Too much traffic on the North End Sub! Description: The American Orient Express at Savannah, GA. Description: AMTK 46, 11, & 51 lead a train away from Pomona Station at Greensboro, N.C. Description: The DuQuoin station caretaker waves as the northbound Illini arrives from Carbondale. Description: Moving toward 30th St. A Sperry car sits behind the 11. Description: The Vermonter comes south at Trackside Pizza. Description: #56 comes north at Wallingford. Description: 824 and 11 idle at Motor Storage. Description: Yeah its dull 7 Grey but this is the Bridge over the Rappahanock River in FB, This was the last Arch Bridge Built in the US back in 1925-27! 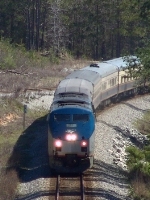 Description: Amtrak 11 leads train #20, The Crescent LTD, Northbound out of Hattiesburg across the Leaf River. Description: Train #19, The Crescent, stops at the depot in Hattiesburg at dusk. Description: Pulls #54 north thorough what once was Hosford St Crossing. Description: After a hectic chase from Opelika, the westbound American Orient Express is shown at Jackson's Gap approaching Alexander City. It is on its way from Washington DC to New Orleans via Charleston, Savannah, Columbus, Birmingham, and Jackson. Description: The AOE is on it's first 2005 tour of the South as it rolls through Powersville, GA at 50+mph. Description: Westbound American Orient Express curves away from the CSX's ex A&WP diamond.